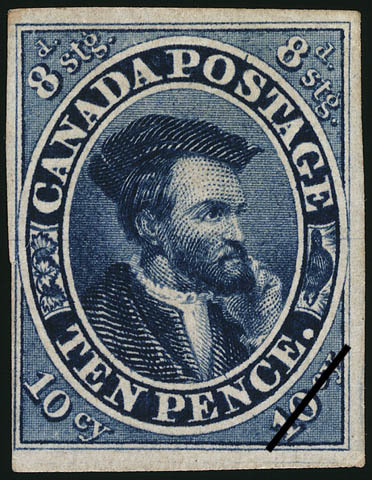 The value of a Jacques Cartier - 10 pence 1855 stamp depends on several factors such as quality and wear, supply and demand, rarity, finish and more. Values in the section are based on the market, trends, auctions and recognized books, publications and catalogs. This section also includes information on errors and varieties and characteristics. In 1854, reduced postal rates between Canada and the United Kingdom created a demand for 2 new denominations in postage stamps; 10-pence and 7½-pence. The Postmaster General's Report of March 31, 1854, announced in part the reduction of postal rates affecting the overseas mail to the United Kingdom. The mail of ½ ounce for each letter sent by packet ships from Halifax was charged at the reduced rate of 6-pence sterling equal to 7½-pence in currency. The rate was also reduced from 1-shilling and 2-pence sterling to 8-pence sterling on mail sent overseas by way of the United States. When W.H. Griffin wrote to the security printers he sketched a suggested design of the 10-penny stamps: "It would promote the public convenience to procure postage stamps of the value of 10-pence and 7½-pence to correspond with the packet letter charges." While these reductions were made in sterling the people in the Province of Canada were being drastically restricted by the confusion of money with its varying degrees of valuation. The Province of that time did not have a currency of its own. Sterling was of higher value than the monetary exchange commonly referred to as currency. For that reason, the new stamps in 10-pence has an additional inscription of 8-pence stg (sterling). The 7½-pence stamps were inscribed "Six Pence Sterling" in the oval frame of Queen Victoria's portrait. Portrait of Jacques Cartier is from a painting by Fran�ois Riss who is said to have copied it from another portrait. Some art authorities believe that the portrait is entirely spurious. M. Riss, a Russian painter who moved to Paris, copied a picture reported to be the likeness of Cartier some 300 years after Cartier's first voyage. The historic chateau de Ramezay on Notre-Dame Street East in Montreal owns a similar painting about 48 inches high by 36 inches. A note appearing in the 13th edition of the gallery catalogue states that no genuine portrait of Cartier exists. The nearest is in Ramusio's engraving of his visit to Hochelaga (now Montreal).